The Riverton dump is on fire. Again. Reports are suggesting that this is the worst fire at the dump yet. We hear similar statements each time there is a big fire at Riverton, yet little to no talk of possible solutions, preventative measures, or relocating the dump away from such a densely populated area. Consider this: last year, almost to the day, there was a huge tyre fire there which took about a week to fully contain. What did the public learn from that occurrence? That the landfill is operating without the required licences. A February 2012 fire cost the nation millions of dollars in lost production hours and an estimated 60 million dollars in firefighting expenses. What did we learn from that one? That for more than a week, Jamaicans in Kingston, St Andrew and St Catherine were breathing in smoke full of particulate matter at “many times the levels to which humans should be exposed,” according to this April 2012 Inter Press Agency report. It is long past time for the government and responsible authorities to take decisive action where Riverton is concerned – and talking is not the action Jamaicans want to see; not when we learn from the same IPA report that respiratory diseases were among the leading causes of hospitalisation and death in 2005, according to Jamaica’s second national report to the United Nations Framework Convention on Climate Change (UNFCC). And definitely not when statistics also show that in 2008, respiratory illnesses were the second most treated complaint in hospitals across the island. Here are some facts about the Riverton dump and air pollution from the Jamaica Environment Trust, some of which will either scare or anger you. The 119-hectare Riverton dump, which is adjacent to mangroves and the Duhaney River, receives 60 per cent of the waste produced in Jamaica. Public health risks from unmanaged dumps like Riverton are: pollution of the Duhaney River, which is used for drinking and bathing by people living nearby; pollution of Hunts Bay, which scientists have called ‘The Dead Zone’ – heavy metal contamination from cadmium, manganese, lead and pesticides. Studies of cadmium levels in the livers of Jamaicans at autopsy have found high levels, second only to Japan and nearly twice as high as levels in Austria, Australia, the UK and Sweden. What do we breathe in when there is a fire at the dump? The toxic smoke from the average dump fire contains a wide range of air pollutants, including particulates, carbon monoxide, aldehydes (eg formaldehyde), acrolein, hydrogen bromide, hydrogen chloride, hydrogen cyanide, hydrogen fluroride, nitrogen oxides, phenol, sulfur dioxides, dioxins and furans. Health impacts of the air pollution from dump fires: increased risk of death among elderly and those with preexisting respiratory and cardiac illnesses, infant mortality, low birth weight of babies, onset of childhood asthma, coughs, wheezing, chest tightness, shortness of breath, burning in eyes, nose and throat, dizziness, weakness, confusion, nausea, disorientation, exposure to known carcinogens. The seriousness of these depends on how close people are to the fire and the length of exposure. Raising animals on the dump is also dangerous due to the bioaccumulation of heavy metals such as lead and mercury into them, which then make their way into the bodies of people who consume them. 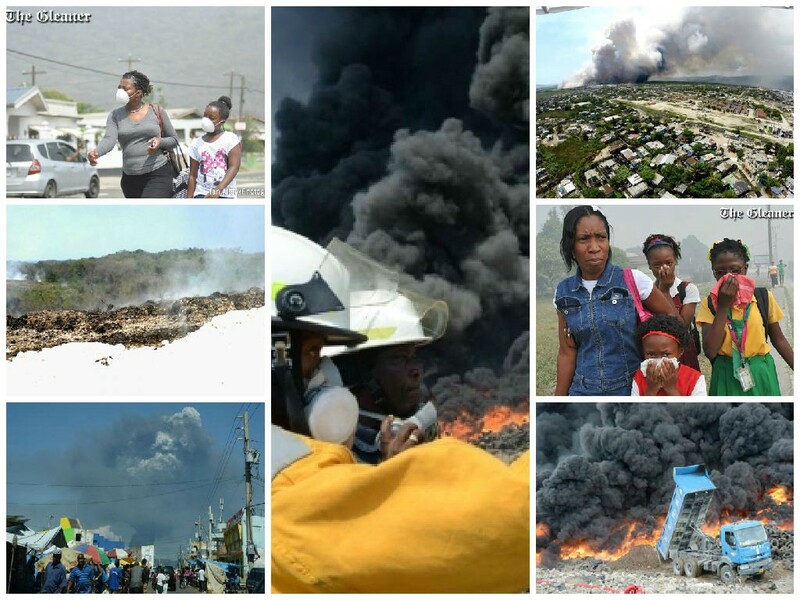 And Kingston/St Andrew and St Catherine residents are not the only ones currently in danger, as the Retirement Disposal Site in Montego Bay, which has also had its share of toxic fires, is currently burning as well. We still don’t know when the Riverton fire will be fully extinguished, and official updates are much too few and far between. Remember, the main health hazard is from the smoke, during and even days after the fire. Although smaller than the current fire, the 2012 blaze lasted five days and there were 17 days of smoke abatement. Everyone needs to take the necessary precautions to minimise the risks to you and your family.